Two circles & Four Semi-Circles: Design Saga w/ Animations — Sketchbook Brewing Co.
THREE IS A LOVELY NUMBER: As Sketchbook rounds the bend and approaches our 4th year, we are so proud to report we have dramatically increased both our production and wholesale sales. Click here to read the press release all about that. The demand for our beer is booming--we are currently producing three times the beer we made in our early days. In fact our little alley-side brewery can't quite keep up. We are occasionally brewing off premises, traveling to quality establishments like Church St. and Great Central Brewing to oversee the whole process. Below is a fun map that shows our current footprint--and we're working with distributors now to get our cans on shelves as far north as the Cook / Lake County border, as far south as Chicago’s loop, as far west as route 53 and as far east as Lake Michigan. This growth required a new look...and we wanted to share that story. THE DESIGN CHALLENGE: Our original name logo is shown below--all praise designer Joe Taylor! We love it but the elaborate typography didn't give us enough versatility and design opportunities. What we needed was a new design that we could scale and adapt to our accelerated roll-out of new beers and merch. And, we really wanted a graphic identity, a symbol that could represent us. GOOD BEER HUNTING: After some searching, we settled on Michael Kiser's team at Good Beer Hunting. And we never looked back. Such fun going down to their space on Wrightwood, brainstorming, filling post-its, drinking coffee, learning to call our new graphic logo 'the bug'! And their sophisticated yet laid back style worked for us. They showed us so many examples of strong design..and developed a new appreciation of how arty craft beer is looking these days. Of course, some of that listening, and talking, happened around beer. Kiser's team worked through a number of new typefaces, proportions, and lock-ups to find the one we loved--solid yet playful--and not too far from our original that would feel familiar to our biggest fans, but also fresh and exciting. Something subtle in the letter forms that gave the viewer an emotional cue. BUG PLAY: Along the way, Alice George (a Sketchbook founder & artist) started playing with the bug, which was adapted from the S and B in our name. The bug's simple, yet rough geometry seemed to demand being in motion. Here's Moody Bug. Working together in a sort of serious play, Good Beer Hunting started to build out this logo, and the way it could help all the myriad 'things' in the Sketchbook universe-- glassware, apparel, growlers, etc. --shine! The whole team became enthused by the imaginative versions Kiser and co. came up with. One of the first bits of design we settled on was for our coasters--these round guys are powerful in the Tap Room because our customers draw on them and post on our Coaster Wall. Inspired by that culture, GBH saw an opportunity to expand the visual experience of that community activity, focusing on the hand-made, spontaneous quality of it all. The little wobble in the shapes really worked for us. "Mark of the Hand" is an important touchstone idea for us, and being just a tad off-kilter reminds us all to have fun with it. 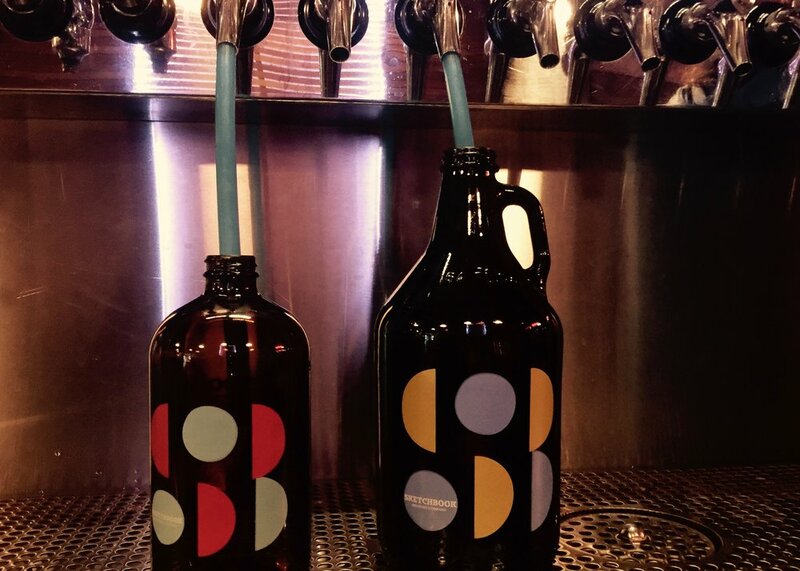 And then we threw the bug on our growlers and howlers. As much as we love the communal expression of our taproom, many of our team members are also professional, life-long artists who get inspired by the pursuit of complex, new ideas — just like we do with beer! Around now, Alice got going on her 2nd animation that she calls Enlightened Bug. EUREKA: As our business and culture expanded, so did the role of our branding. When Kiser and Co. showed us version of the bug in which compelling art shone through the shapes--the two circles and four semi-circles behaving like windows--we flipped! Here’s how the design is coming together on our new cans! These are the first set you’ll be seeing in the world soon. Our in-house design team, aka Beth Rogers, is adapting the new look in imaginative ways. Here's a sneak peek at the design for Pinky Sweater, our Red Rice Pilsner. The culmination of the design process was our 3rd Birthday party for members and friends on 11/13. Seeing the new logo and look 'live' confirmed our decisions. Watch our Facebook and Instagram pages! And...look for a line of the bugs marching across our front window. Thanks for reading!